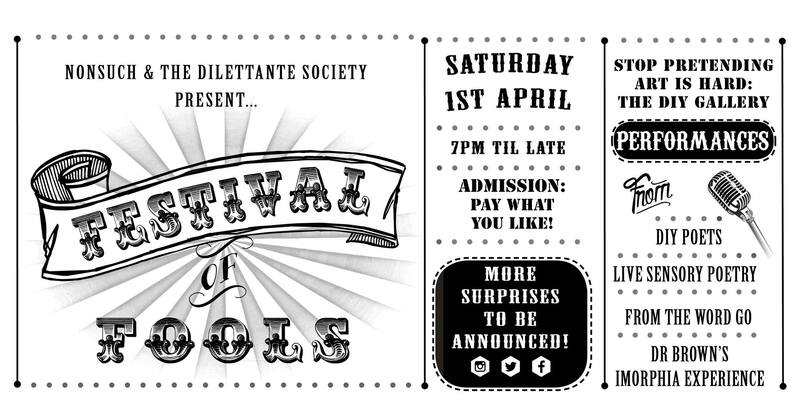 I was invited to present iMorphia at the Festival of Fools event on April 1st 2017, hosted by the Nottingham Dilettante Society and the theatre group NonSuch. This was a great opportunity to create a range of alternative foolish characters and update iMorphia so people could choose a character to inhabit, or be given one at random. Around twenty visitors experienced iMorphia, changing gender and body type, going anime or naked with body tattoos, play acting, dancing, laughing and having fun being foolish. 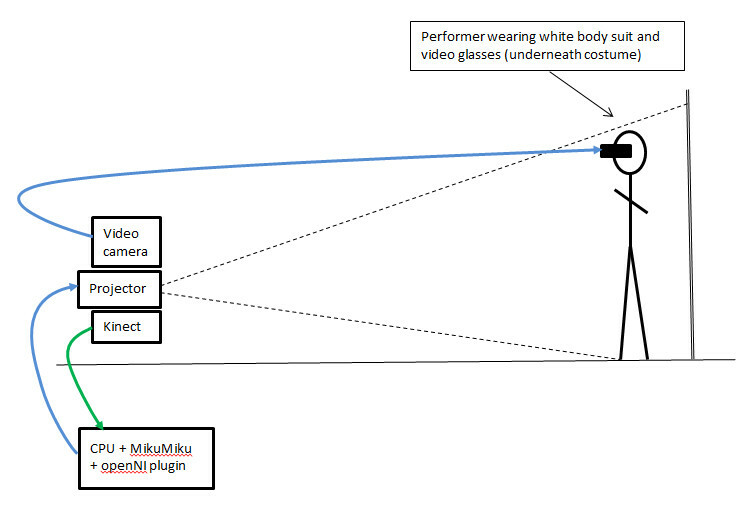 Visitors don a white boiler suit, wear video glasses and facing the projector and body tracking Kinect, a virtual character is projected onto their body. Visitors inhabiting a range of projected virtual characters are shown in the video below. This enactment sought to evaluate whether two performers transformed at the same time might encourage improvisation. The exercise was carried out in a performance space off site, which acted as a means of determining the portability of the system and also enabled a black backdrop to be tested as an alternative to the previous white projection surfaces. The video below illustrates the two performers playfully improvising verbally whilst in opposite gender, alternative less idealised body types against a black back drop and physical dance-like improvisation. Early observations suggest that enabling two transformed performers to appear on stage at the same time does not immediately result in improvisation. Perhaps this is unsurprising, placing two performers unfamiliar with improvisation on a stage without a script for them to work with or a scenario designed to encourage improvisation is likely to produced the same results. Conversation about why there was a lack of immediate improvisation gave rise to a number of suggestions including the idea that the addition of a third element for the performers to work with would give the performers something to work with and encourage improvisation. The third element could take on a number of forms, the entry of a virtual character or perhaps a virtual object that the performers could pass to each other. We all felt that a game like scenario, the throwing of a virtual (or real) ball for instance would immediately encourage play and improvisation. There are a variety of techniques and games designed to encourage improvisation, many of these can be found on the website Impro Encyclopedia. These techniques could be used as a basis for creating improvisational interactive scenarios using the iMorphia platform and adapted to exploit the power of virtual scenography and the interactive gaming potential inherent in the Unity Games Engine. In order to explore the potential of interactive improvisational scenarios and game like performances it is envisaged that the next stage of the research will investigate the addition of interactive objects able to respond to the virtual projected iMorphia characters. In order to evaluate the effectiveness and to gain critical feedback of ‘iMorphia’ the prototype performance system, fourteen performers took part in a series of workshops which were carried out between the 14th and 18th April 2014 in the Mixed Reality Lab at Nottingham University. An interesting observation was the powerful and often liberating effect of changing the gender of male and female participants, producing comments such as “I feel quite powerful like this” (f->m), “I feel more sensual” (m->f). All participants when in opposite gender expressed awareness of stereotypes, males not wanting to behave in what they perceived as a stereotypical fashion towards the female character, whilst females in male character seemed to relish the idea of playing with male stereotypes. These reactions reflect a contemporary post feminism society where the act of stereotyping females has strong political issues. A number of males reported how they felt that they had to respect the female character as if it had an independent life. One participant likened the effect of changing gender to the medieval ‘Festival of Fools’, where putting on clothes of the opposite gender is a foolish thing to do and gives permission to play the fool and to break rules, which was once regarded as a powerful and liberating thing to be able to do. This sentiment was echoed by a number of participants, that the system gave you freedom and permission to be other, other than ones normal everyday self and removed from people’s expectations of how one is supposed to behave. i) The effectiveness of body projection in creating an embodied character that is sufficiently convincing and effective in creating a suspension of disbelief in both performer and audience. ii) How system artefacts such as lag and glitches from tracking errors were exploited by performers to explore notions of the double and the uncanny. iii) The affective response of the performer when in character compared to the objective response when viewing the projection as an audience member. The video below contains short extracts from the four hours of recorded video, with text overlays of comments by the performers. Below are videos taken from a number of participants acting as an early form of “user testing”, an HCI term I am borrowing for purposes of illustration. Strictly speaking it is not classic user testing as no official ethnographic studies were carried out – research questions were not formulated or posed, nor any user interviews or recorded user feedback carried out. However as a form of open ended user feedback the “experiments” (another value laden term in classic research) proved useful and also underlined the value of exposing the system to more participants in the form of the forthcoming workshops. Applying a form of auto-ethnographic analysis I observed that new participants highlighted the differences between someone versed with using the system (myself) and its constraints such as tracking speed and coherence of body mapping. New users pushed the limits of the system and gave positive feedback on “glitches” I had tried to avoid – such as system mis-tracking resulting in a limb jumping out of place or characters contorting in an unrealistic fashion. Verbal feedback of female participants puppeteering a male and a female character also proved interesting. One performer commented on the challenge she felt on becoming the surfer dude character – visually judging them as the sort of person she would not want to talk to in every day life. This observation suggests a series of further tests and the creation of a range characters that people might feel uncomfortable with. Another female participant commented on the feeling of alienation of appearing as a male, stating that she knew she was a woman and not a male so felt a strong disconnection with the projected character, the same participant from her comments appeared to feel more disturbed when taking on the realistic female character in a bathing costume, and used the term uncanny without prompting. Such reactions might also be connected with “cognitive dissonance”. However if I wished to analyse peoples reactions to taking on differing projected genders from a psychological perspective I would need to bring in expert help.